Does the mirror (meer-that is how we say it) reflect a past image or a present one. In that millisecond it took for our reflection to return to our eyes have we changed? In this photo, the water acts as the mirror reflecting the beautiful sky through the Victorian dome of Phipps Conservatory in Pittsburgh. The glass sculpture is by Dale Chihuly. Henry Phipps gave the City of Pittsburgh the conservatory in 1892. Its Victorian Architecture is a reflection of a golden age in Pittsburgh’s history. Phipps was a childhood friend of Andrew Carnegie and partnered with him in the steel industry. He also invested heavily in real estate in New York and Florida owning much of the land where Palm Beach is now situated. Like Carnegie, he was philanthropic giving money to create hospitals to study tuberculosis and mental illness as well as and building housing for the poor. While Pittsburgh has long been associated with the making of steel, it has a great legacy as a glass manufacturing center. As early as 1797, glass was being produced in the region and by 1920, 80% of the glass produced in the United States came from here. From drinking glasses used at home, to plate-glass made by PPG, to the glass tiles used to line the Holland tunnel, Pittsburgh companies made it. Natural resources were abundant and the artisans and craftsmen were drawn here. Unfortunately, the industry is no longer flourishing. Shuttered and abandoned factories are for the most part a part of our manufacturing yesterday. Past and present are both reflected in this shot. 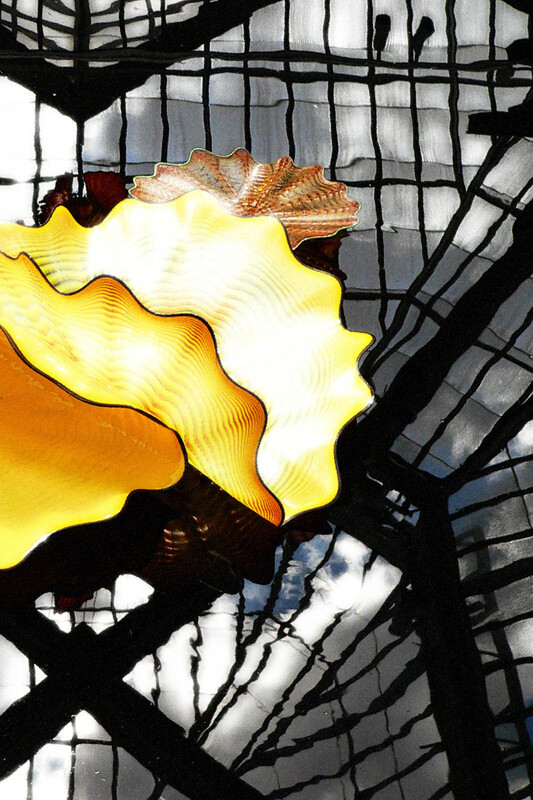 The strength of the steel girder infrastructure and glass panels given by Henry Phipps and the new direction of glass depicted in the artistic creation of Dale Chihuly.